SPROUT garden items include unique and contemporary plants such as passion flower, bamboo, rare ornamental trees and grasses,organic herbs & vegetables, and much more. 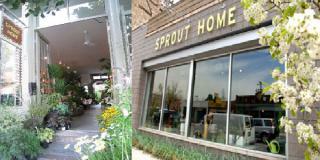 SPROUT also offers design services, specializing in contemporary garden design and rooftop/deck container gardening. SPROUT offers products any urban gardener would need - from ground basics, to tools and accessories, to that one must-have plant for your garden. Please feel free to stop in and browse our product selection and see how modern design can be utilized both inside and outside the home.